They say yesterday (January 6, 2014) was the most depressing day of the new year. Hmmm, I might have to concur with that. Here we are in the brand new year and I'm already fighting time. I dream of being able to get a good (truly) dedicated day in at the jewelry bench. Ugh. So many ideas -so little time in a day to accomplish them. 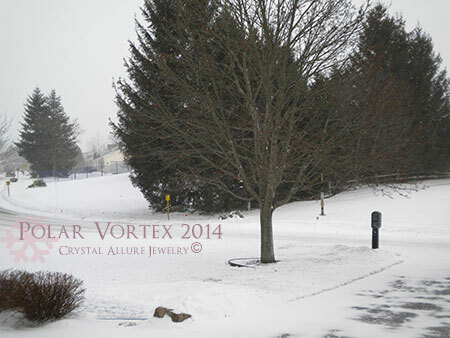 What makes matters worse is today was a snow day off from school for the kiddos -great for them -not so great for Crystal Allure Jewelry. We are actually in the middle of what meteorologists are calling a polar vortex. Sounds cold, right?! Well, it is -in fact, bitter cold! I'm hearing of -55 degrees in some places -ouch! Right now it is 3 degrees here (and this is a huge improvement from last night), but it feels like -16 degrees thanks to the wind. BRrrr! After seeing some of the amazing polar photos of today, the one I took doesn't seem to look as 'polar' as it felt trying to snap it. But let me reassure you, the snow was just whipping around like I was in a snow globe. The picture above is probably a view that is quite familiar. When trying to get the best winter shot, I like to venture out in the cold...no further than the edge of my garage door! All this polar weather happening around the world makes my heart break for any pet that has been left outside. And, if I may, let me be frank here -if you have a pet and didn't bring them in, then in my humble opinion, you are intentionally abusing them. I'll even eat my words if you say otherwise and agree to spend the same amount of time outside with the same level of clothing coverage as pets have fur. I just don't understand it even on a good weather day. I mean why did you get a pet to begin with? Have some respect and compassion for your pets today -PLEASE bring them indoors!! And take that extra 5 minutes to stop your car and try to help an animal you see outside in this ghastly weather we're having. More importantly, if you see any animal outside, call 911 and alert the police. 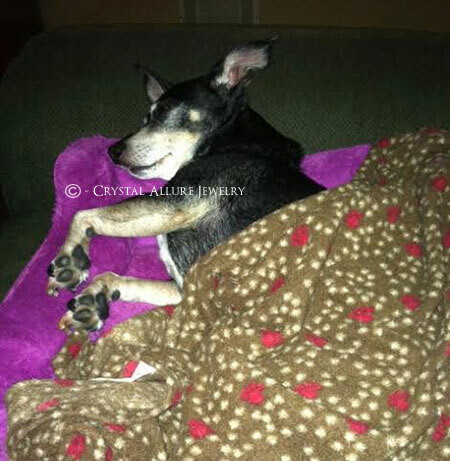 The picture above is my sweet little girl all snuggly and warm in her bed with her blankie. This is how ALL pets should be riding out this cold weather. Wouldn't you agree? If I had to find a bright side to this bitter cold weather it would be that it has inspired more than a few new handmade Winter Beaded Jewelry designs!